The full name of the honeybee that arrived at my backdoor in a huge swarming mass is Apis mellifera ligustica. We live on the water in a semi-wooded area so we’ve logged many great wildlife stories over the years. But the honeybee adventure this weekend ranks near the top. And it’s a neat example of positive thinking leading to good outcomes in one’s life. I insist (in Why Good News) that if you consciously focus your thoughts on the positive, you will have less sickness, less misfortune, less loss, less failure, less crime, less fear and less futility over the long run of your life. When I saw the bees, I might have latched onto fears of "African bees" or generally bad outcomes, but I immediately swatted any fears away, and focused on finding a solution calmly. As a result I was led down a truly enjoyable path. My first constructive thought was calling the Cooperative Extension in our state, a collection of wildlife and master gardening volunteers who dole out information on the telephone, but offices were closed for the day. Next I did what any modern thinking person would do… I turned to the most-wonderful-invention-ever, thank-you-so-much-Tim Berners-Lee, the internet. I googled "swarm of bees" along with my state and found a page describing three beekeepers available for handling swarms. The first expert detailed that his fee was contingent on the location of the swarm. Fee? I didn’t think I’d need to PAY to have someone help me! The third expert luckily lived in our region of the state and after talking to him I realized he had not mentioned money. Not only was he helpful, informative, enthusiastic, and friendly — never mentioning money because bees are his passion — this man was a HOLISTIC professional! His apiary is fully organic. He shuns pesticides, antibiotics, even smoke in the handling of his bees. He maintains his principles and says his bees are much healthier and live longer, even in the face of a dreaded scourge to U.S. bee populations, the epidemic of varroa mites. Laszlo Pentek had thoroughly educated me on swarms, mites and organic techniques over several phone conversations. He informed me that these bees were searching for a new hive having split-off from a group that had become over-populated in its space. They were swarming on the trunk of a tree protecting the new queen while scouts were out searching for a new home, like a hole in a tree (or nooks in houses). It was unfortunate that the next morning, when Laszlo would arrive, I would be leading a litter clean up in my neighborhood so I could not be home for the mid-morning excitement. When Laszlo found the bees, the sun had activated them and they were buzzing loudly awaiting their scouts’ return. He told me that just at the moment he was approaching the tree to collect the bees into a box, they lifted off moving into a tornado pattern and followed their scouts across the lake to a new home. (Laszlo kindly invited me to telephone him should any of our neighbors need his assistance.) So, the matter was cleared up, without anyone being stung, without any cost to me, and with the engagement of a new friend and reference. Further proof that if you believe in positive outcomes, you will likely experience them. Organic Hex Apiaries (Hex, for hexagonal) produces honey without using any chemicals, pesticides or antibiotics. removing honeybee colonies from buildings and such. Carefully cutting open a wall (so as to minimize damage) and painstakingly taking out brood comb, honey, the bees themselves and so on, takes a lot of time and work. Collecting a swarm, when they first swarm – before they establish themselves somewhere is typically far easier, especially when they are easy to reach." In retrospect, I should have offered him some money for gas. But he did say it was worth it, "Missing the swarm – even by just a minute – did not bother me. Ordinarily I might be a little annoyed at having hauled myself, and all my equipment, out into the field for nothing, but just seeing it lift off and leave was mesmerizing." … Thanks again to my new friend, Laszlo, for being such a caring person. Occasionally in one’s life one is confronted by an occurrence that cannot be easily explained. I had one such event with bees. Several years ago I attended a beekeeping workshop at our local beekeepers. He had a raffle and gave away to one of the participants a beehive and swam of bees. I did not receive this prize but the person who did was not equipped to take it home so he gave it to me to take care of for him. I placed the wooden box with it’s bees on the protected deck of our barn out of the reach of bears, raccoons and foxes. The bees came and went but there were no flowers at that time of year. I fed the bees sugar water in inverted jars for months; opening the hive daily, removing the empty jar and gently wiping the bees off it so that I could place a filled jar in its place. I cannot say why I was not afraid to do this. The hive thrived and the time approached for its owner to reclaim it. About a week before the box was moved, when I was replacing a sugar water filled jar, a bee stung me on the knuckle of my left thumb. I was surprised but not hurt. This was the only time that I was stung and it turned out that the sting was on the only place where I have ever had arthritis. From that time on the arthritis swelling has been gone and I continue to be arthritis free. The bees swarmed shortly after they were moved to a new home in the woods and I never encountered or heard of them again. Thanks so much for your thoughtful writing. That really is an amazing thing that happened to your thumb and the calm with which you cared for the creatures. It also reminds me of the story on our page Inspired! Religions, about the monks who lived with the tigers. They were so at peace the tigers knew there was no danger. 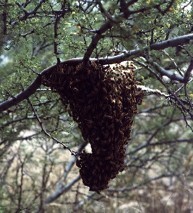 Also, I got an e-mail later from my beekeeper and he said he got the strangest feeling while in my yard of an overarching peace… and he said just seeing them lift off our tree and swarm away over the lake was worth the drive and trouble and disappointment, not having a chance to take them home.